Hello everyone! My name is George Trombley. My wife Yukari and I co-authored the the Japanese From Zero! book series which are the basis for the YesJapan.com course material. Tens of thousands of students have learned Japanese with YesJapan and we are very excited when we see students really excel in the course. Dan Selakovich is one of those students. 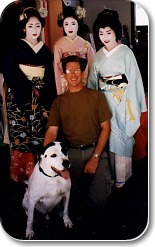 Dan started as a student of YesJapan.com in August of 2000. I could tell by the questions that Dan was submitting to the Ask-a-Teacher service that he was really grasping the lessons. He was asking the type of questions that only someone who was studying Japanese intensely could ask. I was very impressed and decided it might be worthwhile to find out what his techniques were, so I asked him how he did it. He responded by sending 13 printed pages detailing his method in the mail. The techniques and ideas he presented in the package were right on target and even I gained some insight as to how our own teaching methods might be improved. I felt that the package he sent needed to be shared with the other students on YesJapan. Make sure you read completely the text that Dan has sent, because much thought and research time is included in every word. Dan is not just spouting off what he "thinks" learning languages is, he actually has studied and put to use the techniques he has described. I am certain you will learn much more from YesJapan.com after reading Dan's Speed Learning Method.